Easy rules that will have you playing in minutes. The Timeline games are a blast, and this is by far my favorite. The range and genres for both films and music in the deck is well thought out and balanced. The art is what makes this game stand out. The newly rendered images from classic films and classic bands and composers are so stylistic and cool, you’ll find yourself wishing the tiny cards were all poster-sized. Don’t go through the deck before you play for the first time to add to the fun of discovering. With every new Timeline installment, I always like to play the new deck first a few times before mixing it into the master deck. This timeline really stands out, especially for fans of great cinema and music. The game is very simple but noneless fun. You have to place event in the current order on the board. If some musicals or cinematics events may be easy. You’ll struggle on certain period of time. It is face to learn, making it a party game that will be enjoyable by people of all age. The disadvantage is that the owner of the game will finish by learning by heart the date of events so the replay value is limited. 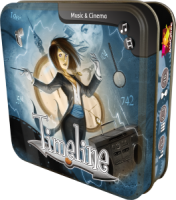 Add a Review for "Timeline: Music & Cinema"